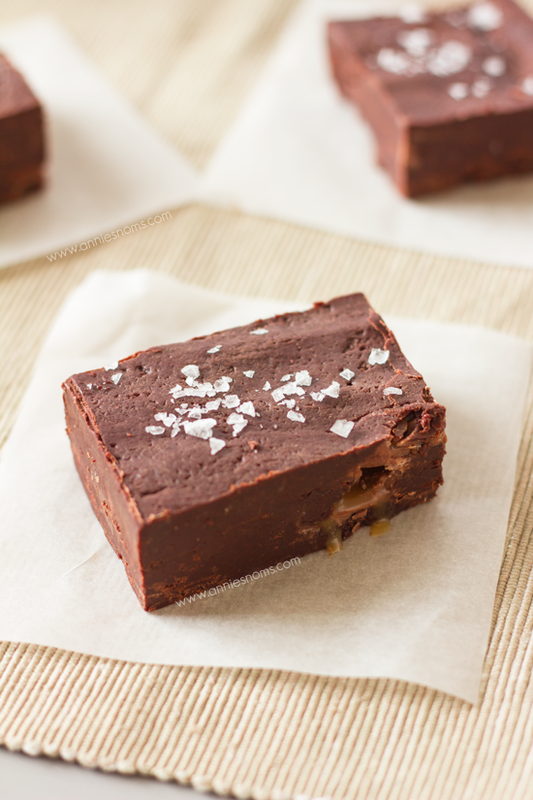 With just 4 ingredients you could have this delicious Salted Caramel Fudge! Melted chocolate is mixed with condensed milk and chocolate caramels to create a seriously naughty treat. 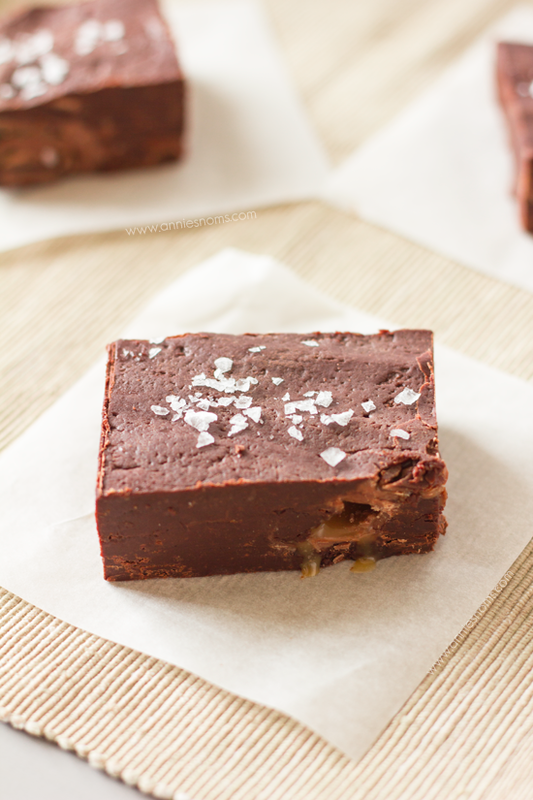 Finished off with some sea salt; this fudge has that sweet and salty contrast that everyone loves! It’s secret recipe club time again! It still amazes me how quickly it comes round every month!! This month I was assigned Rhonda’s blog The Kitchen Witch. 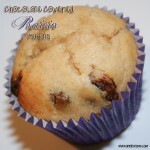 Of course, I headed straight to the recipe page and somehow lost an hour just looking and drooling at Rhonda’s recipes! I also headed over to read about Rhonda and found her instantly likeable! I felt like I was reading about a myself! Totally comfortable in her own skin and says what she thinks – i.e the exact same as me! She’s also traveled Europe on a Harley and is an avid motorcycle rider! I would love to travel across Europe by road, none of that flying stuff – I want to see and experience everything! Fried Chicken anyone? Or how about some Macaroni and Cheese?! The weather is looking pretty miserable right now, so I could definitely do with a big old bowl of comfort! I was so tempted to try something savoury this month, but once I saw this Salted Caramel Fudge I knew I had to make. 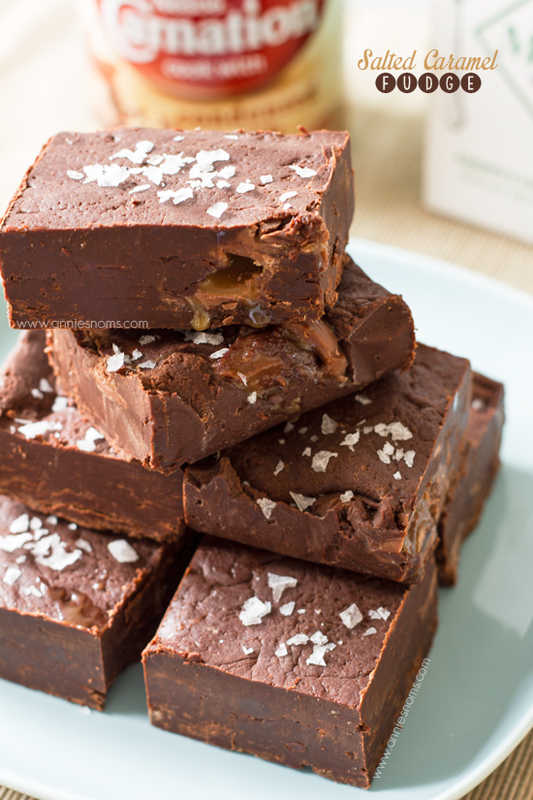 I had all the ingredients to hand (well, we don’t get milk duds here, so I had chocolate caramels) and a microwave 😉 That’s all you need to create this incredible fudge! I apologise now for the awful photos. I was feeling ill and the weather was sunny one minute and raining the next – I just wanted to shoot quickly! Just look at that oozing caramel! I’ve made proper Vanilla fudge before, but never chocolate fudge, even though I’ve wanted to for ages. The fact that this recipe was so quick and incorporated caramel just made it a complete winner! I have to admit, I’m a little love/hate when it comes to the salty/sweet mix. I know soooo many people who absolutely adore it, but sometimes I really don’t! However, with this fudge? 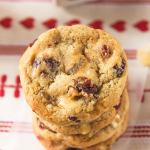 It totally works and is the cherry on top of an already delicious treat! 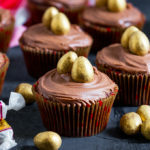 They have a great depth of flavour – rich chocolate with sweet caramel and then the salt hits after, a myriad of flavours in one bite! 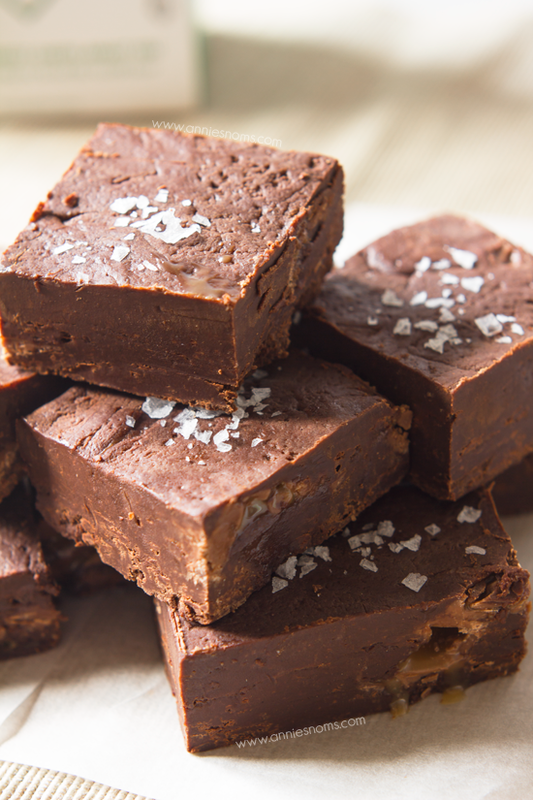 Seriously, this is the easiest fudge in the world to make! Melt some chocolate and condensed milk together, add in a pinch of salt and some milk duds, then leave it to cool before topping with more sea salt – done. With just 4 ingredients you could have this delicious Salted Caramel Fudge! Melted chocolate is mixed with condensed milk and chocolate caramels to create a seriously naughty treat. Grease and line an 8x8 inch square pan. Place the chocolate chips and condensed milk into a large heatproof bowl and microwave for 1 minute. Stir, then heat in 30 second increments, stirring in-between, until all the chocolate is melted. Mix until you have a thick fudgey consistency. Add in a pinch of salt and the chocolate caramels and stir until combined. Tip into the lined pan and leave to cool. Once cool, place in the fridge until properly set. Slice into 12-16 squares and sprinkle a little salt on top of each square. Fudge will keep in an airtight container, at room temperature, for 3 days. Hi, What would the weight be of the chocolate chips in case someone wanted to use a block rather than chips? OMG! This looks absolutely amazing! Love love love!!! This looks awesome 🙂 Visiting from Group A! Aww thank you!! Just wish it could be Summer all year round so I could have decent light! Hooray glad you enjoyed making the fudge, it is sinfully easy! Did you know that I lived in the UK for 4 years? I lived in a tiny village of East Wretham about 45 minutes south of Norfolk. Loved my time there! And thanks for the great write up! Your pictures are wonderful! No, I didn’t know that! Norfolk isn’t that far away from me as I now live in a little village near Chelmsford! Such a small world haha, so easy I’m sure I’m going to make it again soon! Oh how I would love to be taking a bit out of a piece of this fudge right now. Wait, who am I kidding. I’d want to eat an entire piece, or two, or three. It looks amazing, Annie! Thank you Julie 🙂 Yea, I think I lost count after 3 pieces! Uh Oh these look too easy and therefore VERY dangerous!! Maybe I SHOULD NOT pin this one. Yeah, Right!! Haha, they were definitely dangerous whilst I was photographing them, maybe 3 pieces disappeared..! 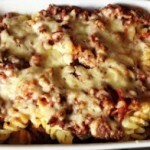 I have made this recipe from Rhonda’s blog many times! It is definitely a keeper. It’s so easy to whip up during the holidays! Great choice!!! I agree, I’ll definitely be making it again, so quick and delicious! 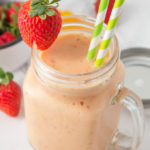 OMGosh so yummy!! I can’t wait to try it out. Oh my goodness! 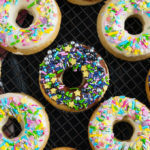 Those look delicious!!! Fantastic fudge – have pinned!! Thank you so much Erin! I’m a bit of a sucker for caramel too!! Thanks for the invite, shall link up in a little bit! This looks soo good! 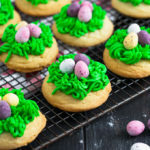 I recently made some cookies that had salt in the recipe, so I know this will be delicious! Thank you so much! I really need to make some salted cookies, I imagine they would be amazing! This is beautiful and sounds so absolutely delicious!! Love the caramel in there…mmm! Milk Dud’s in fudge ~ simply brilliant! I’m visiting from Miz Helen’s Country Cottage. Thanks so much for the recipe. This Fudge is just awesome! Thanks so much for sharing your awesome recipe with Full Plate Thursday and have a great weekend! I love the caramel oozing out of the fudge, looks delicious. I co-host Sweet and Savoury Sunday and would love for you to stop by and share this and other recipes with us. Have a great day Annie! Thank you Laura, I’ve just been over to link up! Thanks so much for pinning Mandee! 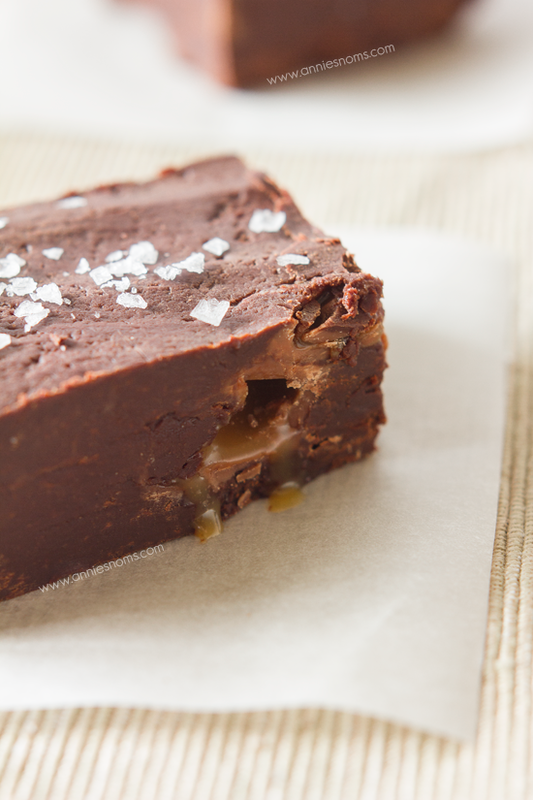 I love salted caramel…your fudge looks so delicious! Pinned…I am definitely going to have to try this!! You have been liked and featured lady!!! And these look SOOO incredible I am TOTALLY making them for my bday celebration this weekend!!! Thanks doll! And please keep linking up with us! We love your recipes!